In the two and a half years since my last review on Gonzo, Tal moved his cart at least twice. 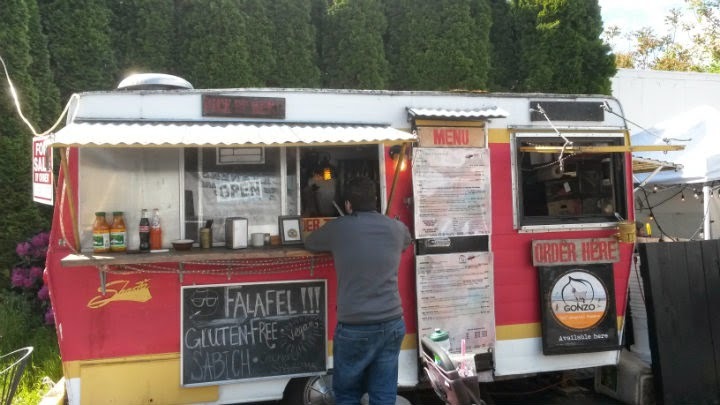 After the D-Street Noshery Pod closed down, he set up at Base Camp Brewing for a couple years. Now, Gonzo can be found at SE 32nd and Hawthorne in Portland. Gonzo is in a separate lot with a Mediterranean cart. Still, that lot is adjacent to the space featuring carts such as Fried Egg I'm In Love and Carte Blanche. And dang, it's worth noting that I haven't officially blogged about those two carts since 2012. How time flies. I revisit spots for several reasons, such as: (1) there may be new menu items; (2) I may wish to revisit a rating I had previously given the cart; or (3) I just love the food and want to blog about it. 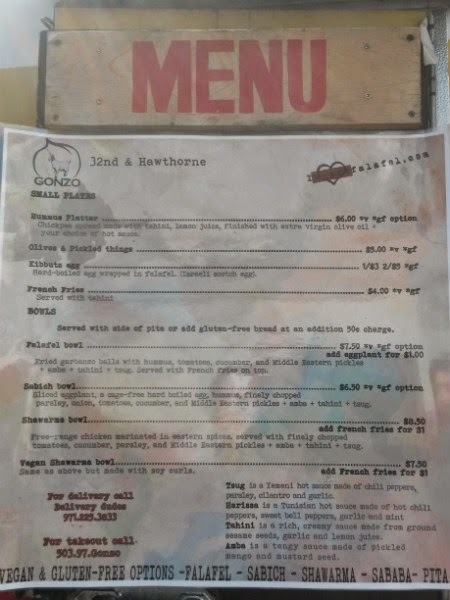 In Gonzo's case, some new menu items had surfaced since my last official visit. Of course, menu prices will generally increase (albeit slightly) over time, and this was no different. There are a few vegan and gluten-free options. Since the cart is not entirely gluten-free, people with severe allergies should take extreme caution. I went with the Falafel Bowl ($7.75): a bowl of their falafel (usually four fried garbanzo balls) with their cart-made hummus, tomatoes, cucumber, and Middle Eastern pickles. 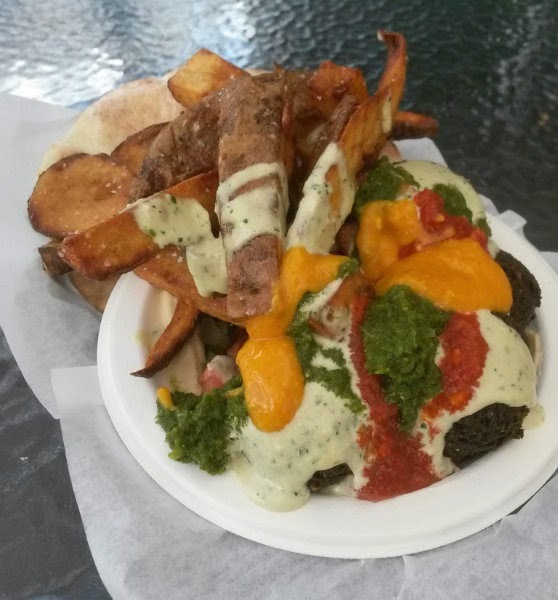 It's served with french fries (thick steak fries and rounded potatoes) and your choice of regular pita or gluten-free pita. To make it even spicier, there's also harissa, a red Tunisian hot sauce made from hot chiles, bell peppers, garlic, and mint. The panda got all four. The falafel here is the star. Extra crispy on the outside and wonderfully prepared. Nice crispiness on the fries. While the pita is good, it's simply a side option here. Fresh vegetables are a lovely contrast from the fried foods in the bowl. The sauces are flavorful and bring it all together. The amba, harissa, and tsug give this an extra kick, but still extremely mild for my tastes. Gonzo now sells their hummus. You can get a container of it at the cart.